Delivery Site combines a serious set of tools to make the experience awesome. Make and share notes. Share projects directly over the network from the iPad. 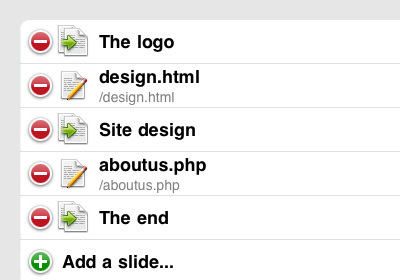 Create and edit HTML slides within Delivery Site. Combine all this with VGA out, a free iPhone app for bluetooth remote control, presenting web content has never been so slick. We've even tried to add a little magic along the way. 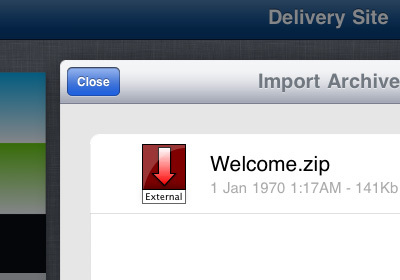 Delivery Site is a great iPad citizen and loves zip archives. You can not only copy zip files from iTunes, but import archives from your email, download archives in Safari and send archives from other applications. We love being able to copy a compressed site to Dropbox and opening it from their iPad app into ours! Forwards. Backwards. If you've used Safari on your iPad, you know how to browse using Delivery Site. We have added a little extra magic: with one tap, you can be whisked away to full screen browsing utopia. With two taps, you can return. Showing off your content is just one part of the puzzle. When you get feedback Delivery Site is there to help. Make notes on any page and Delivery Site remembers for you. If you happen to be on a page that Delivery Site has a note for, it'll let you know. Notes work for all pages, whether they are inside your project or out on the internet. When you are done creating you notes, they are all just an email away. Delivery Site is all about sharing. Whether it is showing designs to one person, or a whole office space, Delivery Site makes sharing your content over a wireless network pain free. If you want privacy, you can password protect. If you want to let everyone know, you can email and broadcast using Bonjour. Sharing is fairly awesome, however Delivery Site takes it to the next level with Follow The Leader. Whether you want to simultaneously look at your projects on many different browsers or if you want people to follow you whilst you browse, Delivery Site can help. The pages you navigate to, the people connected over WiFi to your iPad also navigate to. You lead, they follow. Delivery Site comes prepared for presentations. Not only can you piece together a slide show from pages within your site and bookmarks saved whilst browsing, you can create presentation specific slides. Delivery Site makes it easy to create HTML slides that help enhance your presentation. Delivery Site ships with a set of basic templates and styles to get you off the ground. If that's not enough, Delivery Site makes it easy for you or your web designers to provide your own slide templates and styles. Your content, your presentation. We think presenting with Delivery Site is such an excellent experience, we've provided a free iPhone remote control app.